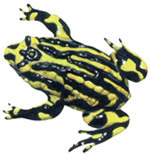 Support Discover Murray River become a Facebook fan! Chris Hammer, who is a journalist and author of "The River, a Journey through the Murray-Darling Basin". It contains over 40% of all Australian farms, which produce wool, cotton, wheat, sheep, cattle, dairy produce, rice, oil-seed, wine, fruit and vegetables for both domestic and overseas markets. As Australia's most important agricultural region, the Basin produces one third of Australia's food supply and supports over a third of Australia's total gross value of agricultural production. 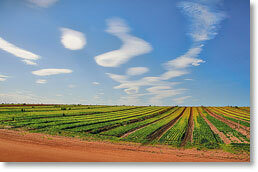 Three quarters of Australia's irrigated crops and pastures are grown in the Basin. While agricultural production is vital to our economy, the Murray-Darling Basin is much more than simply a "food basket". It has an important place in the cultural heritage of all Australians and includes many significant natural heritage features. The national capital Canberra, is located in the Basin along with many of Australia's major inland urban centres including Toowoomba, Bendigo, Albury Wodonga, Tamworth, Dubbo, Orange, Wagga Wagga, Queanbeyan and Shepparton. Over 2 million people live in the Basin. 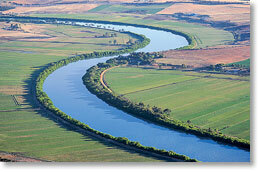 The States in the Murray-Darling Basin include, Victoria, New South Wales, South Australia, Queensland and the ACT. The Basin's most valuable resource is water. 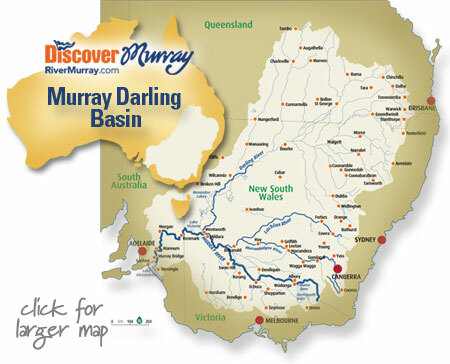 The water in the Murray-Darling river system comes from a very small percentage of the Basin area; mainly along the southern and eastern rim. Almost 86% of the vast 'catchment' area contributes very little or no regular run-off to rivers. The rivers have very low gradients over most of their length, which cause them to flow slowly as they meander across the vast inland plains. the Murrumbidgee River (1575km long). The Basin has a big variety of climatic conditions and its highly diverse landscapes range from sub-tropical conditions in the far north, cool humid eastern uplands, high alpine country of the Snowy Mountains, the temperate south-east, to the hot and dry semi-arid and arid western plains. The Murray-Darling Basin is home to a large number of different plants and animals. 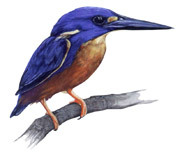 It has at least 35 endangered species of birds, 16 species of endangered mammals and over 35 different native fish species. Unfortunately, 20 species of mammals have already become extinct. Many of the native plants and animals are protected in national parks and other reserves which comprise about 7 percent of the Basin's total area. The Basin has over 30,000 wetlands, some of them listed internationally for their importance to migratory birds who visit the sites and many others within the Basin from other parts of Australia and overseas. Each year, millions of moths migrate from the black soil plains of north-western NSW and southern Queensland to aestivate (hibernate in summer) in the Australian Alps. 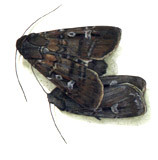 In the past, Aboriginal people congregated in the mountains in summer to feast on the protein-rich moths. Found mainly on the tablelands of the southern and eastern parts of the Basin. Its caterpillars feed on mistletoes growing on eucalypts. Confined to eastern Victoria and far south-eastern New South Wales. Male adults become brightly coloured during the summer breeding season. Occurs throughout the Murray-Darling Basin, but is not common. Pairs maintain specific territories and prey on birds, small mammals and insects. Australia's largest freshwater fish found through-out the Murray-Darling river system. Adults can live up to 50-60 years. Formerly widespread, their numbers have declined since the 1950s. The Murray-Darling Basin is Australia’s most important agricultural region, accounting for over 39 per cent of Australia’s gross value in agricultural production. The range in climatic conditions across the Basin means there is a whole range of agricultural commodities produced. The Basin has been termed Australia’s agricultural heartland, it’s ‘food basket’, but it is much more than that, as its agricultural output makes a major contribution to the National economy. Agriculture provides the raw materials for most of the Basin’s manufacturing activity, as well as many processing companies beyond the region. According to Australian Bureau of Statistics, about 3.5 per cent (290,000) of Australia’s workforce is employed in agriculture, with the figure just for the Basin likely to be much higher. Sheep and cattle enterprises dominate Basin agriculture, especially in the western catchments but also across the Southern Basin. 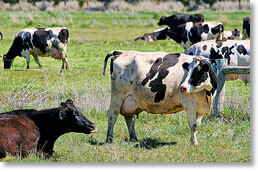 Dairying is limited to northeast and north-central Victoria and Southern New South Wales in the Murray Catchment, however small areas do exist in the South Australian Murray River and Condamine catchments. Basin livestock also include pigs, poultry, goats, deer, bees, ostriches, alpacas and horses. Sown pastures provide grazing and hay production. Many consist of introduced plants, such as subterranean clovers, annual medics, serradella, and lucerne and various perennial grasses. The Basin’s major food crops are cereals – barley, oats, cereal rye, buckwheat, triticale, and wheat. Cereals cover 7.8 million hectares or 8.5 percent of the Basin’s agricultural land. 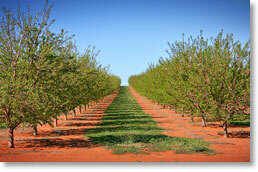 47 per cent of Australian cereal farms are within the Basin. They account for about 25 per cent of the Basin’s gross agricultural production value. The Basin is also a major producer of a large number of horticultural crops such a citrus, stone fruits, pome fruits, grapes and vegetables. Nearly all of Australia’s rice crop is grown in the Murray-Darling Basin across a total of 176,000 hectares, producing 1.6 million tonnes. 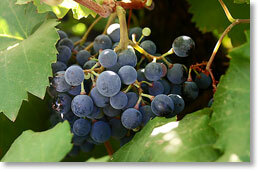 The crop was valued at $348.9 million in 2001. About 2,000 farming enterprises grow rice in the Basin. The future expansion of the industry is affected by access to overseas markets and resource constraints, mainly the availability of irrigation water. However, producers, in cooperation with researchers, are looking to increase their production through varieties that give higher yields and require less water. The Basin area under cotton production totals about 490,000 hectares or 93 per cent of the total Australian cotton growing area of 527,000 hectares. The major growing areas are along the Darling and especially its tributaries in northern New South Wales and southern Queensland. In the long term, the Basin has the potential to make a major contribution to the expansion of Australia’s food exports, provided practices are undertaken in a way that is consistent with sustainable land management. However, as shown in 2001 Agricultural Census, the drought conditions which have occurred over the last decade (since about 1995) have affected, to varying degrees, almost all parts of the Basin resulting in reduced output and therefore the incomes of many agricultural enterprises. In managing the Basin’s natural resources, the MDBC is consistently aware of the crucial link between ‘profitability’ and ‘sustainability’. It promotes awareness of the need for changes to the management of the land and water resources of the Basin and is coordinating salinity management at a Basin scale; including monitoring the health of the Basin rivers and is also responsible for coordinating distribution of water from the Murray River to New South Wales, Victoria and South Australia. Become a Discover Murray River Facebook fan!